Unilever is officially the world’s third largest consumer goods company, behind Procter & Gamble and Nestle, having generated a turnover of €49.8 billion in 2013, across its staggering 400+ brands. It is often said however that the company focuses on just 14 brands – those that each generate sales of €1+ billion. If this were the case, the question arises as to why Unilever retains such a large portfolio of brands and why future “selective acquisition” is highlighted in its most recent annual report? Star (HIGH Market Share, HIGH Market Growth): These are brands very much at their peak, holding a large market share in very much a growing market – therefore requiring continued investment to hold or enhance their position, as competitors continually enter the market and innovate. For Unilever, a prime example of this is Lipton, the world’s best selling tea brand. Despite its existing stature, continued investment in the patented TESS technology (which uses the natural essence pressed from freshly picked leaves) enabled a global re-launch of Lipton Yellow Label that fuelled growth of 5.6% in the last two years. Cash Cow (HIGH Market Share, LOW Market Growth): These are yesterday’s top products in industries that have since reached saturation. This is arguably the most important category of brands for companies like Unilever as they require very little further investment to generate revenue – allowing for profits to be reinvested into Stars or Problem Child brands. Marmite is a key Cash Cow for Unilever with sales just about holding their own in the spreads industry that is slowly beginning to decline in Europe and North America. Investment in Marmite in recent years has been largely limited to advertising campaigns. 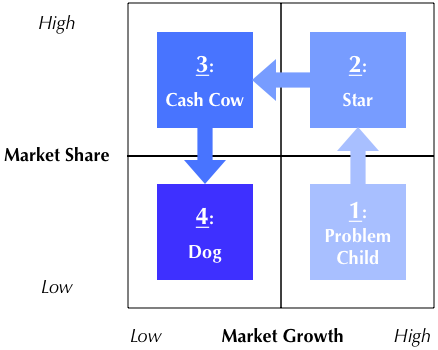 Problem Child (LOW Market Share, HIGH Market Growth): These can be described as tomorrow’s bread-winners (Stars). Often relatively young brands, they are yet to maximise their potential within the industry and therefore require greatest investment from the success of Cash Cow brands in order to exploit the fast market growth ahead of competitors. The excess profit from brands like Marmite has been reinvested into new innovative brands like T2, the fast-growing premium tea brand in Australia, and new products like Small & Mighty liquid detergent, under the Omo brand (Persil in the UK), which concentrates the same number of washes into a bottle one third of the size. Dog (LOW Market Share, LOW Market Growth): These are the dead-end products whose time has been and gone and likely most offer no future profits. Simply keeping them on the market is wasting resources generated by Star and Cash Cow brands. Dogs should be disposed of unless they somehow contribute to the sales of other brands/products within the portfolio. For this very reason, Unilever sold its Slim-Fast brand in July 2024 to private-equity firm, Kainos Capital, to focus on other brands with greater appeal and growth potential. The diet industry has changed dramatically since the brand’s fast growth in the early-2000s to the extent that it was used by 45% of the American health and weight management market – today replaced by fads such as the 5:2 program. Therefore, for Unilever to secure its long-term position as the third largest global consumer goods company, ensuring a sufficient number of Problem Child brands today is as crucial as Stars and Cash Cows, as funded by today’s Cash Cows and Stars. Excellent portfolio management by Unilever will see T2 become the future Dove or Tipton, before naturally becoming a Marmite and subsequently another Slim-Fast, but smart investments will prolong the growth stages and hold off the decline. This long term perspective is a key strength of the BCG Matrix as a strategic tool. However, there are still a couple of cautions to be considered when using it. Firstly, market growth may be directly influenced by Unilever due to its market power. For example, as Lipton is the world’s best selling tea brand, an increase in investment by Unilever would lead to a growth of the overall market and give the impression that the market is a Star, when in actual fact it should be a Cash Cow. It can also be misleading in terms of defining whether a market is growing or not depending on the brand’s countries of operation. For example, Unilever claimed in 2013 that the soups market declined in developed markets. 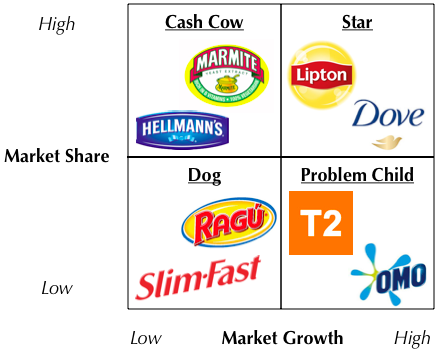 Therefore, if operating solely in developed markets, a firm may seek to divest its perceived Problem Child brand before it rapidly becomes a Dog even though there are still growth opportunities outside developed markets (which would indicate Unilever’s Knorr soups could actually still be a Star). Despite the limitations, the BCG Matrix is a very simple and useful tool for portfolio managers to review their brands and products across industries and SBUs, and assist in prioritisation of investment and divestment. It clearly dispels the belief that Unilever focuses on just 14 brands; in reality, these are simply today’s Star brands that are seen within a bigger picture that also consists of the other three BCG Matrix categories. This entry was posted in Marketing Mix and tagged BCG Matrix, Boston Consulting Group, Boston Matrix, Cash Cow, Dog, Dove, Hellmann's, Lipton, Marmite, Omo, Persil, Portfolio Management, Problem Child, Product Portfolio, Ragu, Slim Fast, Star, T2, Unilever. Bookmark the permalink. Thanks for the comment, glad it helped you out!